As the chart below illustrates, NAFTA members Canada and Mexico are Tennessee’s leading trading partners, totaling almost 40% of total exports. China and Japan rank 3rd and 4th respectively. 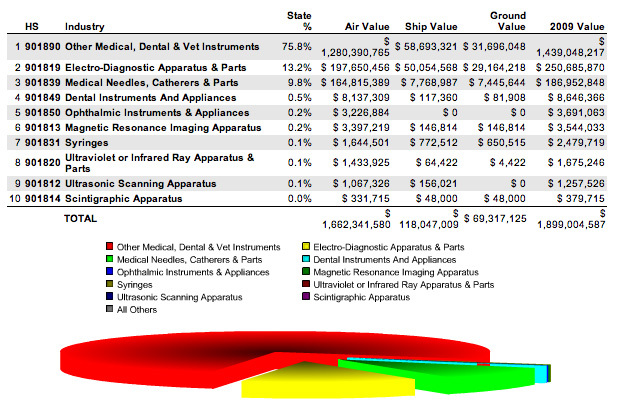 The state’s leading export was again the medical instrument sector. Exports of these products grew just under 16% to $570 million for the quarter. The gains were global, including Europe, Australia, and both East and Southeast Asia. Other medical-related sectors also had strong quarters. Orthopedics and artificial joint exports grew to $232 million, a greater than 50% increase from 2010, thanks to large increases in Japan, the Netherlands, and Australia, among other nations. 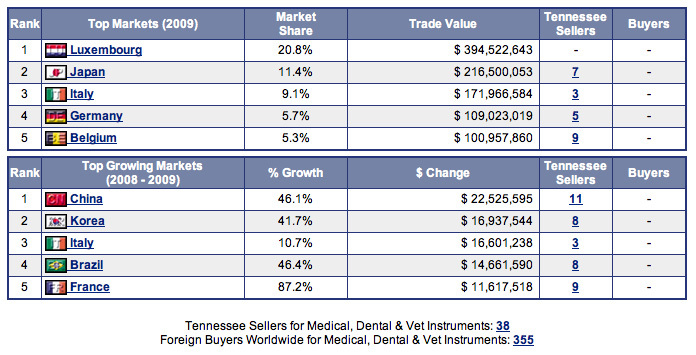 In the Medical equipment sector, Europe is Tennessee’s top export destination. Yet the Asian countries of China and Japan show the highest growth. Readers may note, however, that the data (obtained from PIERS StatsPlus Interface) is dated 2008-2009. U.S. Census report for State Exports for TENNESSEE shows that exports for HS code 901890 (Medical, Surgical, Dental and Vet equipment) have been growing rapidly over the last few years rising from $1.1 billion in 2007 to $1.6 billion in 2010. The following chart indicates that the aforementioned “child” HS category under the “parent” 9018 product group represents 76% of the total exports within the grouping. Further research utilizing the statistical data from Census could also reveal the average price per unit for any of the product categories by dividing the respective values by the number of units. Thus, syringes’ (901831) price per unit results would be much different than ultrasonic devices (901812). Product groups are transported by different methods depending upon urgency and fragility. 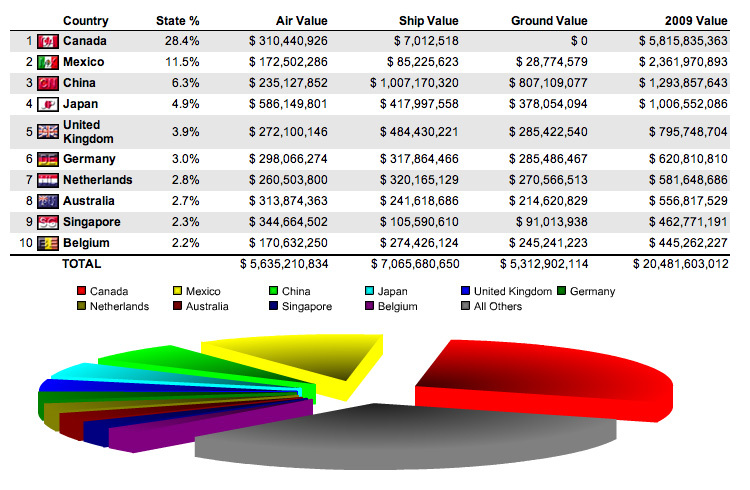 A greater percentage of syringes are shipped by container (ship) and truck (ground) versus air than other categories. Tennessee ranks third among U.S. states as exporters of medical equipment. Only California and Massachusetts boast greater export activity within the sector. Texas and Illinois are also contenders. Additional research can uncover the actual traders beneath the trade figures listed. Beneath the statistics are real stories of companies, trade deals, jobs, employees… fortunes made and fortunes lost. The charts utilized in this article come from PIERS Prospects and PIERS StatsPlus Trade Intelligence applications. Clicking on any of the above images will display the full sized chart in a separate window. Readers are encouraged to share the information at will with appropriate referential sourcing of PIERS and WorldTradeDaily.com.